The SheEO Blog is not all about domestic violence. But it is an issue that affects all of us and I realized after my last post that tomorrow is the annual White Ribbon Night. So I thought I would revisit this issue with a new lens: the one that is firmly from the viewpoint of men. Because in my last post I asked you to consider what we – all women and men – can do to help prevent family violence. But, of course, violence directed at women is not a women’s issue and things will never change til more men get on board. White Ribbon gets this. It’s Australia’s only national, male led campaign to end men’s violence against women and the campaign works through primary prevention initiatives involving awareness raising and education right across the spectrum of our community from schools, to workplaces, and beyond. 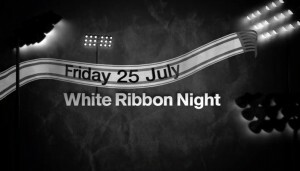 It turns out that TOMORROW Friday 25 July is their annual White Ribbon Night (is that timing serendipitous or what?) and this night is all about getting men together to unite in ending violence against women. Great idea… but even if your special man (READ: you dad, uncle, partner, husband, son, boss, neighbour, etc) is a nicest guy on the block he might need convincing why HE IS THE ONE that needs to make this change happen. At least one woman dies every week from domestic violence in Australia. It happens in the most wealthy suburbs through to the most remote; no one is immune. In 2005, over 1.2 million women across Australia experienced domestic violence at sometime during their lifetime. Domestic violence (combined with sexual assault perpetrated against women) costs the Australian taxpayers around $13.6 billion every year. And 800,000 working women will their ability to earn a living compromised by domestic or family violence. What about men? Yes, domestic violence is experienced by both men and women. But the majority of perpetrators of violence are men and only 4% of assaults against men are perpetrated by a female current or former partner. So the greatest need for action lies with the men. Gender violence is not a women’s issue; it’s a men’s issue. This clip says it better than I do and it should be compulsory viewing for every man in every home, every workplace and every university. I’ve just shared this post with the special man in my life – and asked him to pass it on to his mates. I hope you’ll find someone special to share it with too. You can register to participate in White Ribbon Night, or make a donation to support ending violence against women, here.